This general assumption is confirmed by the work of Lif Holgerson (2006). This study compared subjects following their use of xylitol-sweetened chewing gum, tablets, candy, mouth rinse, and toothpaste. It was found that toothpaste produced the lowest overall oral exposure. In defense of the use of toothpaste, however, Jannesson (2002) found that over a six month time frame using just a 10% toothpaste did reduce the levels of cavity-forming bacteria in test subjects' saliva and plaque. 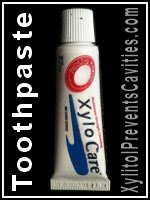 Look for toothpaste products that have a xylitol content of 25% or more. We performed a web search as a way of identifying some of the different brands xylitol toothpastes that a consumer will find available. The stated amount on these products ranged from a high of 36% (Squiggle's Enamel Saver Toothpaste) down to 10%. We also encountered a number of products that did not document a specific content level. How a toothpaste's content is calculated. In regards to toothpaste labeling, xylitol percentages are calculated on a "by weight" basis. Using just a little bit of math, it's easy to figure out that a four-ounce tube of toothpaste that has a 10% concentration will contain about .4 ounces of xylitol. This is on the order of 11 grams. Of course, the important question isn't how much xylitol is in the toothpaste tube but rather how much dosing you get with each brushing. Calculating what your per-brushing exposure is. Figuring this out isn't quite so easy, primarily because the amount of toothpaste each person uses varies. When fluoride toothpaste is used, the dental community has always suggested that a pea-sized dab of toothpaste is sufficient (much less than most advertisements typically show). Depending on what your impression is in regard to the size of a pea, this amount might run on the order of .4 to maybe .8 grams of toothpaste. For the sake of argument, let's consider the larger amount. If a person uses the toothpaste that has the highest percentage of xylitol that we found (36%), then with each brushing they might receive a xylitol exposure on the order of .3 grams. That's not a whole lot. And you're going to need other sources in order to meet your optimal daily xylitol requirement. But as mentioned above, just using xylitol toothpaste alone has been shown to provide some benefit. The toothpaste products we found. Let us get this rant off our chest first. We find it somewhat insulting that some companies make a xylitol claim for their toothpaste but do not back it up by stating a percent concentration. Many times this lack of documentation is related to the fact that the product contains such a small amount of xylitol that the company doesn't want a consumer to be able to make an easy comparison with other products. Our opinion is that companies that clearly state their toothpaste's xylitol content should be rewarded by way of consumers purchasing their products, the others should be avoided. That's because customers need adequate information about the products they buy, so they can make an informed decision regarding their use. Here's a listing of toothpaste products that we found available via our web search. We display this information here simply to demonstrate the different levels of content that we found being offered. This list is not all-inclusive. There very well may be other products on the market that do have high concentrations of xylitol but either we did not find them or could not document their exact level. If you know of any well documented products, please leave a comment below. How to estimate the relative xylitol content of toothpastes. During our research, we took the time to compare the stated xylitol content of each toothpaste with its list of ingredients. Example #1: A toothpaste with expected high xylitol content. With xylitol listed first, this toothpaste should make a good choice. As you probably already know, the items found in an ingredient list are stated in decreasing order. This suggests that those toothpastes with comparatively higher xylitol content will be those where xylitol is listed closer to the beginning of the list. Example #2: A toothpaste with expected moderate xylitol content. The lower positioning of xylitol in this paste's list suggests that it contains a comparatively lower concentration of it. In comparison, and as expected, the lower-concentration toothpaste (10%) we found had xylitol listed further down the line. Example #3: A toothpaste with expected low xylitol content. The fact that xylitol is listed low in this list, and well below sorbitol (another sweetener), suggests that this toothpaste makes a worse choice than our other examples. This last example illustrates what might be considered to be a low-quality product. Imagine a toothpaste product that states it has xylitol in it, yet its packaging contains no numeric documentation of this fact. Then, when you look at the ingredient list, you see something like in Example #3. Notice that xylitol is way down in the list. And even worse, it's preceded by another sweetener (sorbitol). As the pages of our site discuss, the usual reason sorbitol is used in a product, instead of just 100% xylitol, is related to the fact that it is less expensive. The scenario we describe here would suggest that this manufacturer is not serious about making a quality xylitol product. Both xylitol and fluoride use can help to prevent cavities. And since each works via a different mechanism, when used appropriately, a person can benefit from both. Toward this goal, some manufacturers include both in the formulation of their toothpaste. Parents of children need to be aware of the fact that the ingestion of excessive levels of fluoride can lead to dental fluorosis (children often swallow toothpaste rather than spit it out). The most common outcome of this condition displays itself as spotchy-white areas on a child's permanent teeth. Take note of what you buy. And if the xylitol toothpaste you choose contains fluoride too, you'll need to ask your dentist for guidance in determining when its use is appropriate for your child. XyliWhite Strawberry Splash says point-blank on the label it is 25% xylitol. Branham Yum Yum Bubblegum doesn't make a percentage claim, but the ingredient list begins "Purified water, xylitol..."
Thanks for the input Chris. I'll take a look at the two you mention and update this page. I've finally gotten around to updating this page's tables. This is a great resource. I love it. I read on Medscape that erythritol has been scientifically studied to be more potent at caries prevention than xylitol, but it is more difficult to find. For those of you who don't know, erythritol and xylitol are both the same type of compound (sugar alcohols). And studies have shown that they both provide a similar anti-cavity effect. Since it's a sister compound, in the near future we'll add pages to XylitolPreventsCavities.com that detail its use. Xylitol toothpaste with high Xylitol content. Just found the SQUIGLE brand of toothpaste with 36% Xylitol! I use the non-fluoride one called Tooth Builder. The ingredients are: 36% Xylitol, water, calcite glycerin, poloxamer, cellulose gum, calcium propionate and lactoferrin. Great tatsing and I also use the ZZZ brand of ZZZZZZZZ mouthwash in the cinnamon flavor. I haven't been able to find the toothpaste locally so I get it through the web at less than 9$ shipped which I found is the lowest price anywhere. My next purchase (today) will be the Xylitol in granular form at Natural Grocers here in Prescott, Az. Where to get Squiggle for $9.00? Please share with me where I also can get and try Squiggle toothpaste for $9.00. I am still trying to find fluoride free, but with high xylitol. There are plenty of online sources. Even the Squiggle website has links to a vendor selling its products below that price. Thanks for the information about Squigle toothpaste Robert. We Z'ed out the name of the rinse you mentioned because that product does not state it's xylitol content. We refuse to support manufacturers that don't provide that information for the people who use their products. How about adding pure xylitol (which you can get on Amazon, Ebay or health food stores) as a powder to regular toothpaste? 1) One concern would be if your addition of the xylitol would change the abrasiveness of your toothpaste. In the case of powdered xylitol, it be easy enough to assume that it would dissolve quickly and therefore this issue not be a concern. Overall, keep in mind that xylitol adds nothing to the effectiveness of your brushing experience. Having xylitol in your toothpaste is just a convenient way to get a few of your needed daily xylitol exposures. If you want to associate xylitol with your brushing habits, consider doing this. >>Brush first and be done with that. Then just sprinkle some granular xylitol in your mouth and let it linger. a) You'll get a dosing of xylitol that can actually be measured. b) Nothing is cheaper than granular xylitol, which would be just fine for this application. c) Since most people rinse out after they brush (thus washing away the xylitol and reducing the availability of it to the cavity-causing oral bacteria it can affect), this method gives you a more effective (longer, higher concentration) exposure. Which is better Squiggle or Epic Dental? Does the higher xylitol content make a difference? Yes, "better" in the sense that one creates a larger exposure of xylitol when an equal amount is applied to your brush. At 36% vs. 31%, you could get the same exposure of xylitol from both, by using an additional 15% or so of the Epic paste. If you can buy the same size tube of Epic for more than 15% or so less than Squiggle, then that product would seem to make the better buy. You'd use slightly more, but your costs would be slightly less. - Given that our bodies produce between 5 and 15 mg of Xylitol (an anti-microbial), I/ we can consider it safe......commercially obtained largely from Birch trees. - noting above a recommendation to add it "to regular toothpaste" ..... most toothpastes contain Sodium Fluoride or alternate Fluoride compounds ( industrial waste products from, primarily, Aluminium producers). So... when is the last time you brushed your teeth with RAT POISON?? GOOGLE it! Further, read the caution on children's toothpaste packaging re supervision and...if accidentally ingested; CALL YOU POISON CENTRE. - I mix 1 or 2 four gram packets of Xylitol with about 20 grams of Sodium Bicarbonate (Baking Soda)to make a toothpaste. If you choose, you can swallow it for added health benefits. The above comment is the poster's information and opinion. It does bring up the important point that commercial toothpaste is not intended to be swallowed, by any user but especially children. And just to clarify for anyone reading, we're sure the poster means they swallow the very small amount of their homemade (baking soda/xylitol) mixture they use on their brush when brushing, and obviously not the entire 24 grams of mixture all at one time. Hi! My 4-year-old rarely spits out - really hard to get her to do so after brushing - so she swallows her toothpaste. I use Xyliwhite and only a pea-sized amount. Should I be concerned about this? No, our comment about swallowing toothpaste was primarily intended to refer to swallowing those that contain fluoride (swallowing fluoride during the time of tooth development can result in a type of permanent tooth staining called fluorosis). You'll have to look at the ingredients of the specific product your child is using, but when we looked up "xyliwhite" we found a product stated to have 25% xlitol and no fluoride. Swallowing a pea-sized dot of that toothpaste 2 or 3 times a day should pose no problem. However, as a best practice (for future years and products), it wouldn't be a bad ideal to always encourage your child to spit out when brushing. You mentioned using xylitol toothpaste without fluoride but the dentist and this article sags to use xylitol and fliuridecto reverse or remineralize decay that's not in the dentin yet? What is the best way to aggressively repair 19 teeth that need to be remineralize date home so the decay won't progresses. Dentist said it could be reversed and nothing needs filling at this time. Thank you for your help! As we state, we think the use of both xylitol and fluoride make an excellent plan. However, if you use a product that contains both, you need to be aware of that fact because it's ok to swallow most xylitol products (a sugar), whereas the same is not true for fluoride (especially for young children). The benefits of xylitol use are slow to develop, so on a short term basis, the use of fluoride would be the more "aggressive" of the two. wal mart has powered xylitol. how would i use this with my kids? sorry if this is a dumb question. You simply need to know how much quantity it takes create the daily exposure needed. With granular xylitol the ratio is 1 teaspoon = about 4 grams. With the powdered form, it's usually about the same. With either product, you'll simply need to check its packaging so you know for sure what the ratio is. The dosing for your kids will depend on their size (young kids vs. mature teens). Then, do the math about how much daily volume is needed. It's best to provide several exposures throughout the day, so divide the daily amount up into 3 or 4 "servings." You could sprinkle some of it on food as a sweetener. You could put some in water and use it as a rinse. You might sprinkle it on your toothbrush/tooth paste. Or whatever other ideas you come up with. These products contain 30% xylitol, look for this product on your store shelves in 2017!!! My dentist to is actually a professor of tooth decay at NYU and said he would have to investigate if citrus might create a loss of effectiveness on xylitol . He still hasn't gotten back to me so I thought I check to see if anybody knows the answer. .
No, we're not familiar with the study to which they are referring. We searched the PubMed database using the keywords "citrus xylitol" and only found this reference, which dates back to 1998. We read the article. The study involved investigating the use of xylitol as a repository of calcium ions that might help to promote tooth enamel remineralization, as a preventive for dental erosion. Dental erosion is the loss of tooth mineral content, such as due to the presence of an acidic environment. But the acid involved is not created by oral bacteria (which is the case with tooth decay) but by other exposures (like drinking citrus juices). We wouldn't think that this article alone (since it's slightly off-target to the subject of tooth decay, the subject of this website) would warrant your professor's statement. So possibly they are referring to something that has yet to be published, or admittedly, simply something our search didn't turn up. Keep anything with Xylitol from your dog, it is extremely poisonous to them. I know that there are people that will think it is ok to brush their dogs teeth with human toothpaste. Something that is this deadly to a dog should in my honest opinion be marked as such. We agree that that is an important fact to be aware of. In your table of toothpaste brands, you show "Xlear Spry Cinnamon Toothpaste" has 25% Xylitol. The product we are referring to is the fluoridated version (we've updated our table above). We are proponents of the use of both xylitol and fluoride in the prevention of cavities. Thanks for bringing this to our attention. The higher xylitol pastes don’t make one with fluoride, so curious, I wondered what I’d find in a tooth powder. Just starting to look and haven’t found one yet, but, I fid find a profuct called xxxxx Tooth Powder which lists xylitol as its first ingredient - which, although that doesn’t tell me the percentage, I’m thinking is a good sign. I’m someone who reads reviews, and one reviewer who really likes it, but said it “soaped up” his mouth too much. do he mixed it with some other products, including another tooth powder called xxxxx, which has fluoride! The stuff is made in the UK, but I’m assuming that I’ll be able to find some place online that I could order it. Is it possible that I’ve stumbled across a solution marrying the best of both worlds? We think it's great that you'll use both xylitol and fluoride for cavity prevention. Since they work by different mechanisms, that makes a good plan. Our comment here would be, and as mentioned above in our text, a person's dosing of xylitol via toothpaste is generally small. Above we estimate that for a 36% product, it might be on the order of .3 grams per brushing. Assuming someone brushed three times a day, that's roughly a .9 gram exposure per day. A 25% product (we list two above that contain fluoride) would deliver roughly .6 grams or so. That difference, .3 grams, compared to an adult's daily needed exposure of 7 to 10 grams is relatively inconsequential and could easily be made up via whatever other source(s) you plan to use for xylitol exposure. You're making your life harder than it needs to be. My dentist gave me a tube of 12% fluoride in an inactive base of ascorbic acid, carbomer, citric acid, flavor, glycerin, and triethanolamine (whatever that is). its basically Fluoride. He said brush teeth regularly with any toothpaste, rinse, then brush with a pea sized amount of this and keep in mouth for a minute. Then rinse. Only available through dental office. Said its a good fluoride treatment to use in conjunction with xylitol. FOr xylitol, he suggests using Xylimelts (over the counter at CVS or RiteAid). At night, they stick to gums or molars and dissolve slowly over 6-8 hours. Can also put in mouth during day. Easy. We concur that since xylitol and fluoride work via different mechanisms, it makes a great idea to use both approaches. Thanks for the mention of Xylimelts, we have them listed in our tables found on our mints/lozenges page. Since your post doesn't mention the dosing regimen your dentist suggested for xylitol, don't overlook the fact that a minimum daily exposure is needed for it to be effective. We don't see how anyone could know for certain but we have our doubts. They list xylitol as an ingredient but don't state a percentage or quantity (we've looked at the ingredients list on some of their products and on their website and could not find this information). In the ingredients lists we did see, xylitol is listed halfway down the line. We'd guess there are much better products to buy.